Our own Matthijs "Justwait" Groot, Method tank, officer and multiple World First holder, has been at the Blizzard campus over the past few days and he's been checking out the next big patch coming to Battle for Azeroth. 8.2: Rise of Azshara is set to address many of BfA's issues and move the story forward in a big way, as we finally get to see queen Azshara's plans. As you might have heard, me and a dozen members of the community that you all know and love got invited to a summit at the Blizzard Entertainment headquarters in Irvine. They have set this up to receive direct feedback from us, and show us the new additions to the game coming in 8.2 with the Rise of Azahara. We started the day off with the presentation about the new patch, which was a lot like the reveal stream today. Afterwards we went straight into playtesting of the new patch to get hands on with the new systems and had a couple of rounds of round-tables after that. 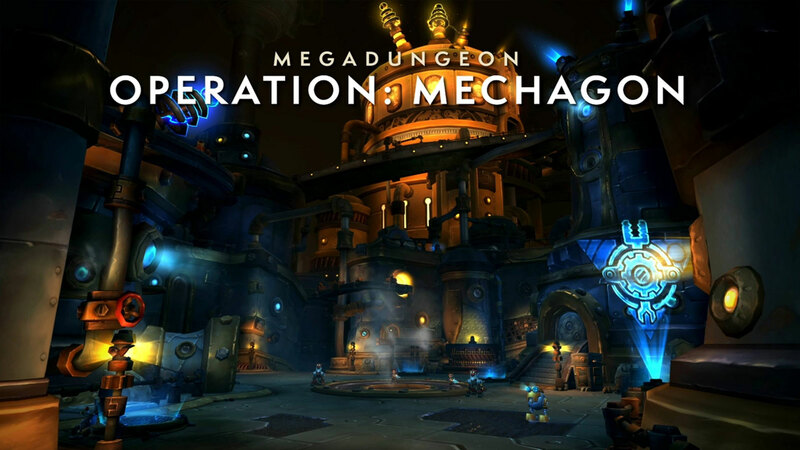 The first playtest session was focused primarily on the new zone Mechagon, a mechagnone island focused on the fight for resources and eventually the fight against King Mechagon in the new Mega Dungeon! We got to see their new approach to the outdoor world, with rares and all the little secrets on the island. First off, the new resource gathering system to unlock small world events makes the world feel alive (as long as there are players around and activating them) and gives you small goals to work towards alone or with friends. The island also provides a crafting system, which is focused on very mechanical crafts, from grenades you can use while doing world quests to mounts that you can colour! 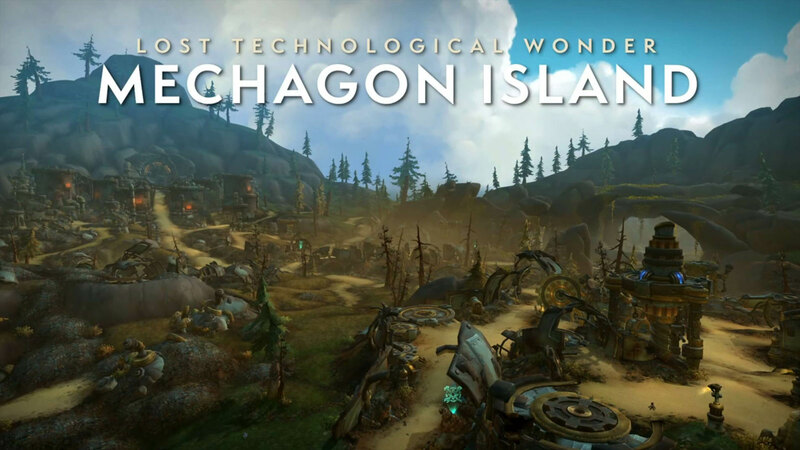 All in all Mechagon looks to be a fun area where a lot of time will be spent, not only to unlock flying, but also beyond that for all the interesting things to discover and find. As well as playing through the new area, we also got to check out the new Azerite system that is coming with 8.2. This new expansion upon the system brings with it new customization for everyone and allows us to get special traits, use effects and skills to fit the right playstyles. Important to note is that almost all of these effects are shared between everyone, aka they are not class or spec specific. There was one sort of specialization specific essence, in that it reduced the cooldown of a specific skill, but we didn't see any others of that kind. They have done this in a way that is very reminiscent of Glyphs, as you have 1 major slot and 2 minor slots. 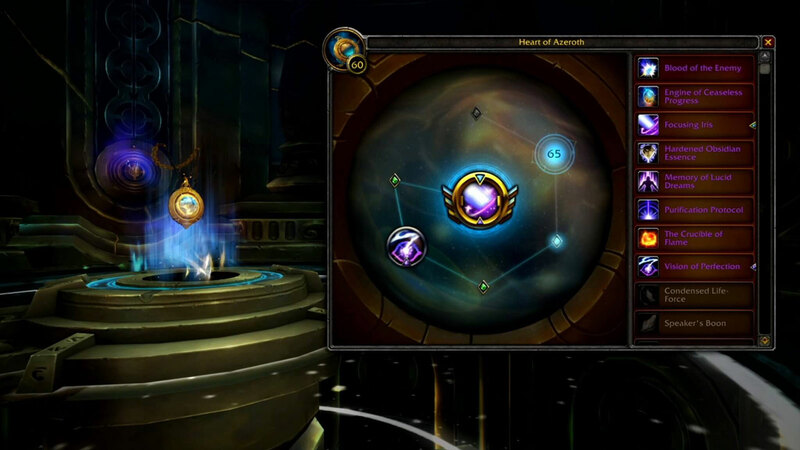 When you unlock the system, it starts off with 1 major, slot and you can then unlock more by leveling up your Heart of Azerite. That which you can fill the slots with are so called Essences, which can be obtained from a variety of sources. Some might come from a world quest or reputation, others from PVP and then there will be some in the raid. Think of any activity and there will most likely be Essences connected with it. These essences also have several ranks, providing stronger and more effects. Finally, there is a 4th rank for every essence, providing only a cosmetic upgrade, a lot like the artifact weapon skins used to be. While it does allow everyone to tinker and minmax with what they want for specific situations, I am worried that it will end up being very generic between specs and classes. That we will run the same Major slot for most tanks, dps and healers as it turns out one of them is too good in most situations. Here are some examples: one Essence, when slotted in a major slot gives you the ability to shoot a fireball out towards the target. If this fireball deals enough damage, it will most likely be the go-to for all classes. The passive effect of the same essence would be to provide 500 crit rating, which will activate when it’s slotted in a minor slot as well as be active in a major slot - yes, you get both the minor and the major essence effect when it is slotted in a major slot. You can only use an essence once, so you cannot have 1x fireball major and then 2x fireball minors as well. You will have to use different essences which gives you different effects. As a last note on the system, currently respeccing works like your talents, as long as you are in a rested area or have a tome buff you can respec the Essences in your Heart of Azerite at no cost! At this point it was lunch time, and after we all rested up it was time for the first round table, where we got to ask questions about anything we had seen but also any other questions we might have. 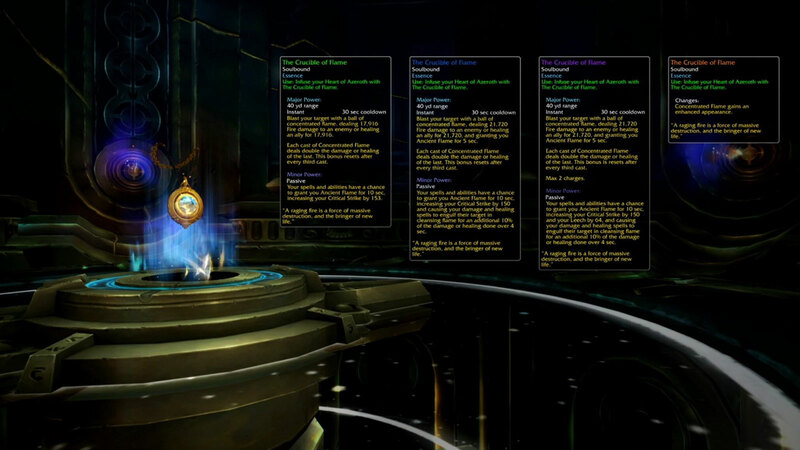 Discussions about the new Mechagon and Nazjatar zones and the dungeon and raid were all discussed as well as how the Heart of Azerite system would work. 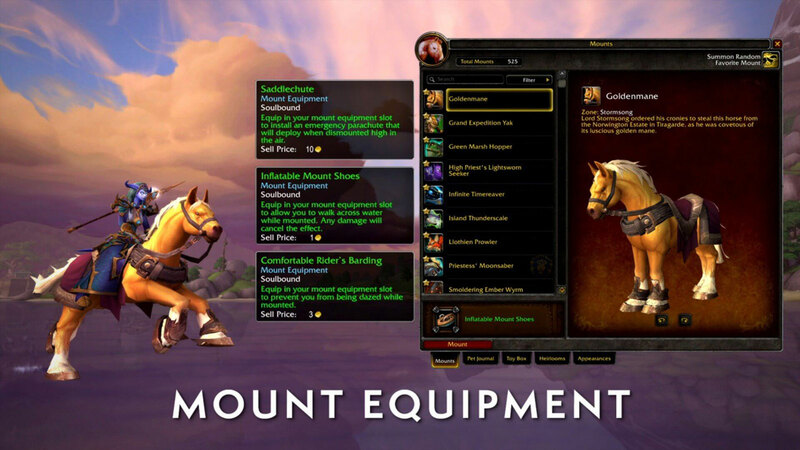 We also got more in depth with the Mount equipment system, as we didn't have items available in our playtest. Important things to note were that Waterstriders will lose water walking, but if you had the reputation with the anglers there will be an easy and cheap way to get the related equipment item and thus you will be able to obtain water walking fairly easy. The items will work a lot like gems, once you have it equipped you can overwrite it with any other item which will then will be consumed in the process. Tanks will still be be unable to be dazed, so they already have that passive effect! Just like Death Knights can waterwalk, they can also pick another item. Now imagine Death Knight tanks! Next up was the second playtest session, this time focused on the mega dungeon where we go after King Mechagon. This dungeon is much like Karazhan, as there are 8 bosses. We got to test the second half of the dungeon, which is mostly indoors where you make your way to the king. The first half takes place outside, as you make your way to his city. This dungeon looks to be very well set up and felt fun to run through, changing up from just fighting to also battling the environment through a conveyor belt, stealthing past alarm-o-bots and sliding down a huge shaft. You can really feel the mechanical theme in this part of the dungeon, and I don’t doubt that it will already feel like that in the first half as well. I tried pulling all the bosses blind, and hoped we manage to 1 shot everything, but sadly this didn’t happen as there are some interesting mechanics on some of the bosses which will provide interesting challenges. After this playtest session it was now time for a second round of questions, focused on the dungeon but also any raid questions. The underwater boss was discussed first: it is a stationary boss that moves to different static positions in the room where you will have to follow it around near platforms on which you could rest when needed. 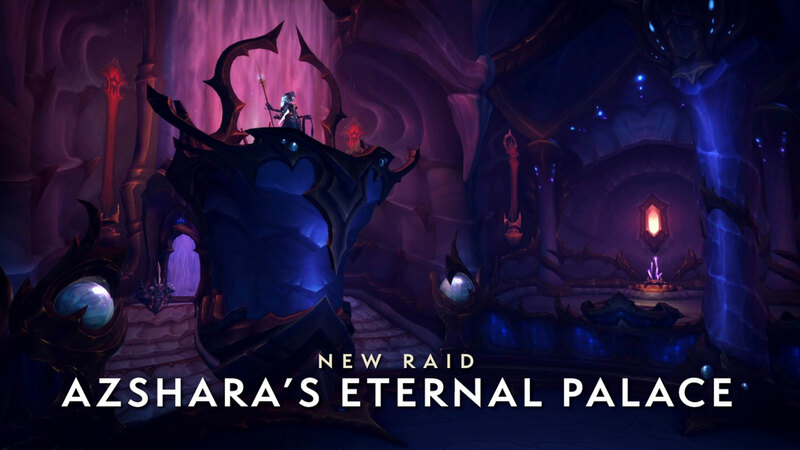 We also talked about how the raid release will work, and how both the raid and the mecha dungeon will release weeks after 8.2, unlike BoD which was released months after 8.1. The time was not right at the time for BoD as guilds were still working on Uldir, but with 8.2 we should be ready for it. Tuning for raids in general was discussed as well, and they agree that BoD was perhaps too steep of a increase between Stormwall Blockade and Jaina. This was more a problem of the bosses before Jaina being too easy rather than Jaina being too hard - they liked how difficult Jaina was. 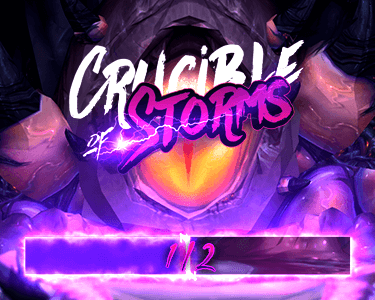 The next raid, Crucible of Storms, coming next week, will be tuned so that the 1st boss will be around the middle of the Dazar'alor difficulty pack, and the last boss will be near equal to Jaina’s difficulty, as the 2 boss mini raid is an extension of this tier. After this last round table we got a small tour around campus in places where we were allowed, they have many new projects and ongoing development which prevented us from going everywhere. We then got on a bus for one final dinner with the community team and several members of the development team, where we got to discuss and provide a lot more feedback on everything that was on our minds, as well as give feedback on anything the developers wanted to know from us. Thanks to Blizzard for inviting us, and allowing us to get up close and you listening directly to us. Hopefully this can happen more often, as it feels like the developers can be disconnected from the community and events like this show they care, as we do, and help lift the barrier between us.